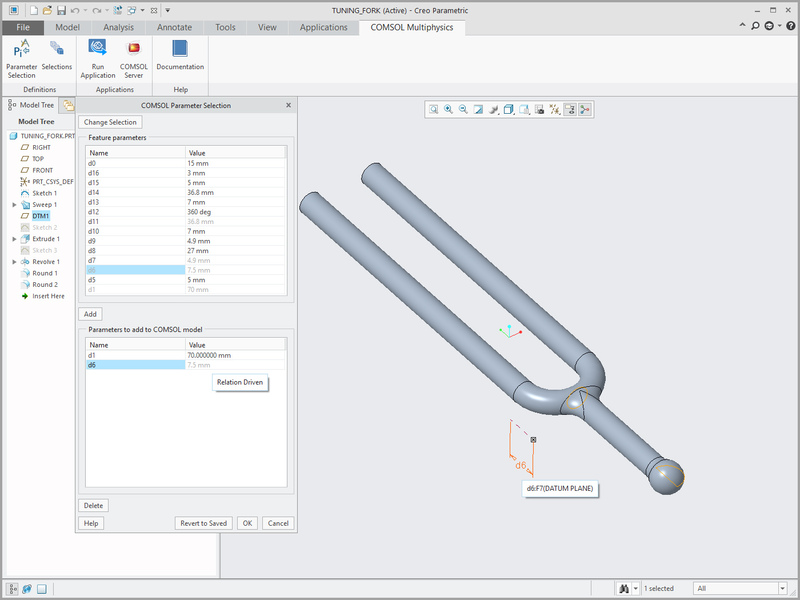 For users of LiveLink™ for PTC® Creo® Parametric™, COMSOL Multiphysics® software version 5.4 brings support for synchronizing read-only parameters, object selections generated for material selections, and user-defined selections. See the LiveLink™ for PTC® Creo® Parametric™ updates in more detail below. The d6 parameter is relation driven in this PTC® Creo® Parametric™ part file. After synchronization, the d6 parameter appears in the Read-only parameters section and the associated global parameter, LL_d6, can be used in the simulation setup. After synchronization, the COPPER material selection appears in the Object Selections table. The synchronized COPPER material selection can be accessed as input to the Union 1 operation to form the union of all objects that have been assigned the COPPER material in the PTC® Creo® Parametric™ file. 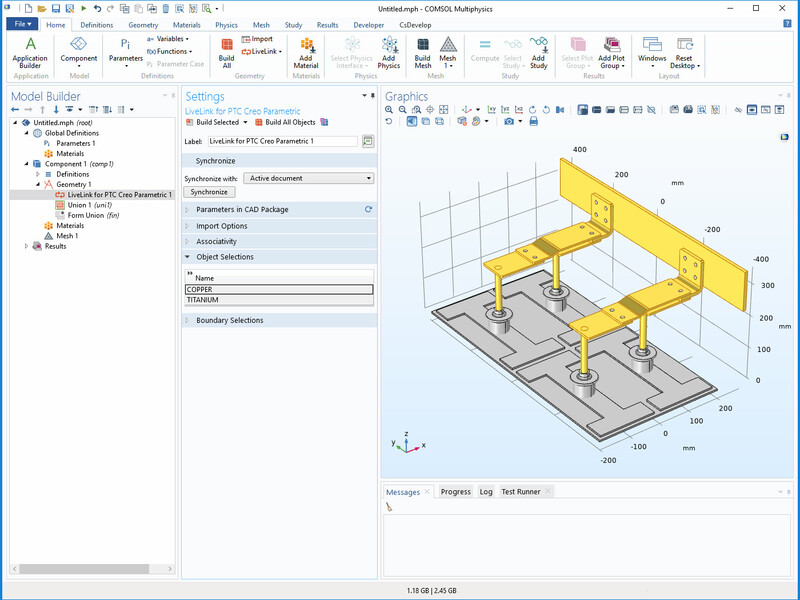 Expanding on the functionality that synchronizes selections based on material assignments in the CAD model in PTC® Creo® Parametric™, the LiveLink™ interface now adds support for user-defined selections. 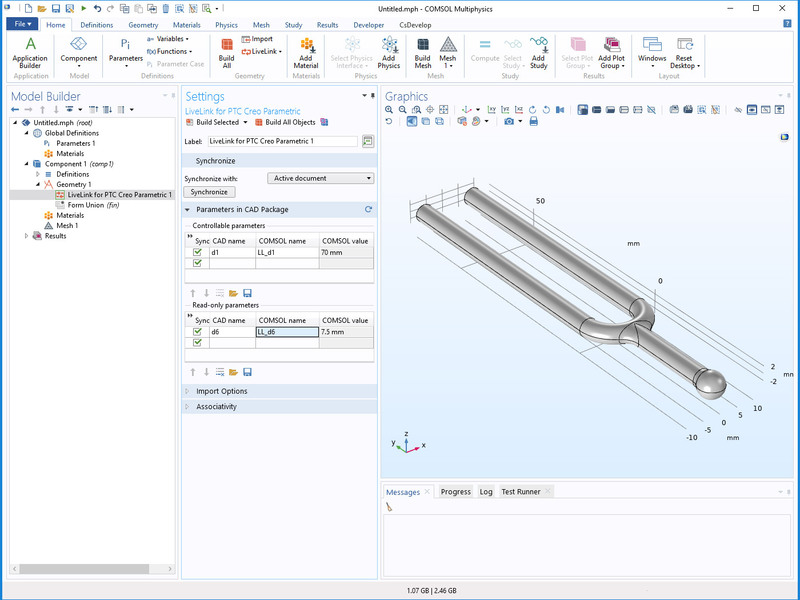 In the newly added COMSOL Selections interface in PTC® Creo® Parametric™, you can define selections that are synchronized with the COMSOL Multiphysics® model. 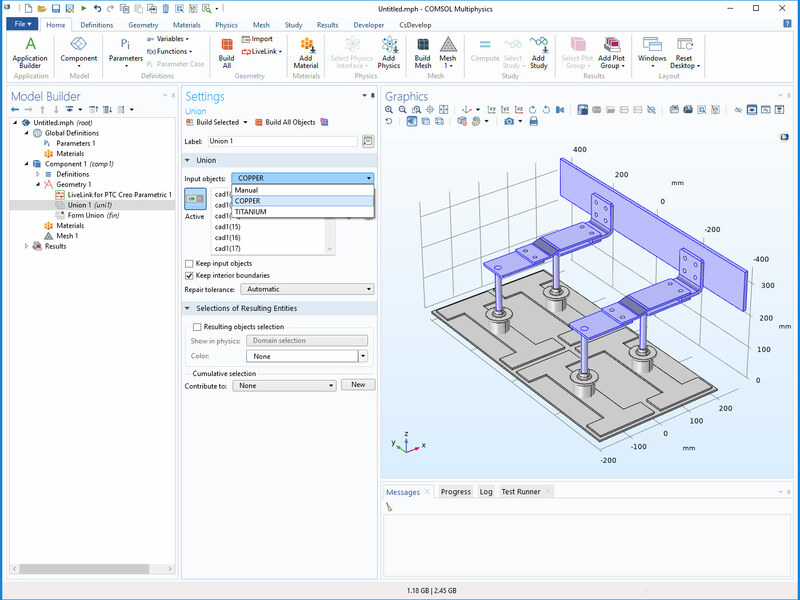 You can choose to synchronize selections for assembly components, features, bodies, faces, edges, or points, which become selections in the model when the CAD design is synchronized with COMSOL Multiphysics®. The selections defined on this assembly of an induction motor are synchronized with the COMSOL Multiphysics® model. The selections defined on this assembly of an induction motor are synchronized with the COMSOL Multiphysics® model. 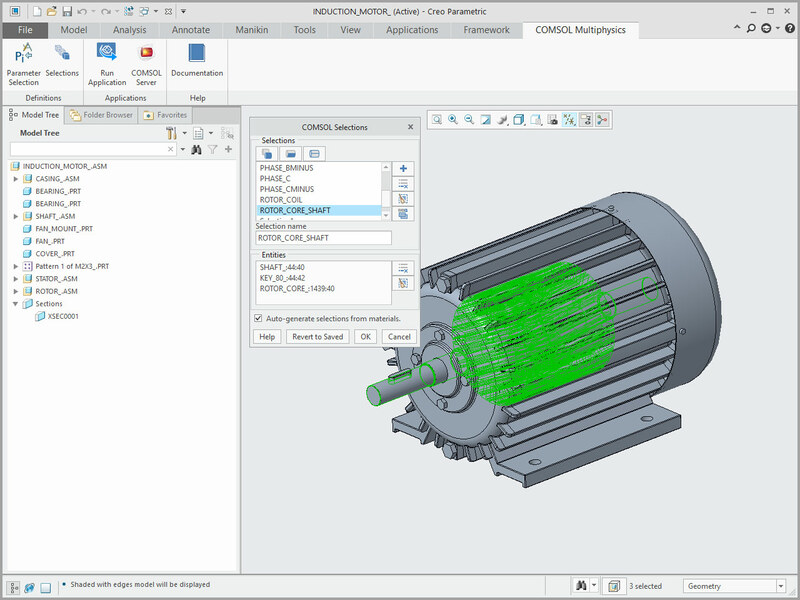 The selections synchronized into the COMSOL Multiphysics® model, which were defined in the PTC® Creo® Parametric™ induction motor. 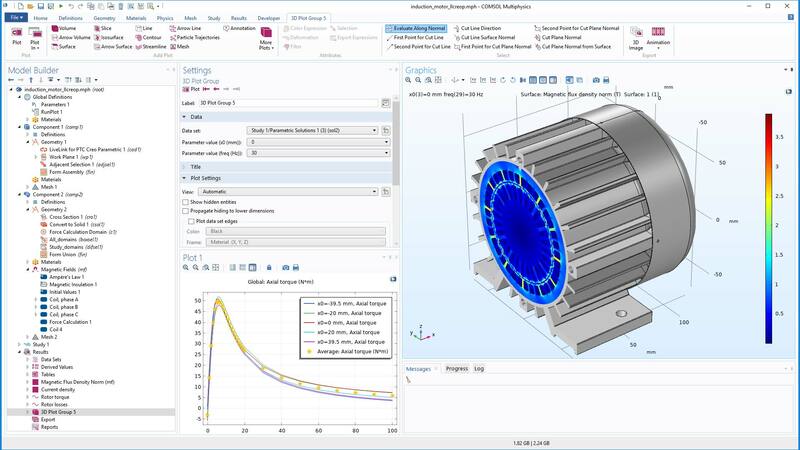 The selections synchronized into the COMSOL Multiphysics® model, which were defined in the PTC® Creo® Parametric™ induction motor. This new tutorial illustrates how to compute the torque of a three-phase squirrel-cage induction motor at various speeds. The torque is computed by averaging the results from simulations performed on 2D cross sections at several locations along the induction motor. 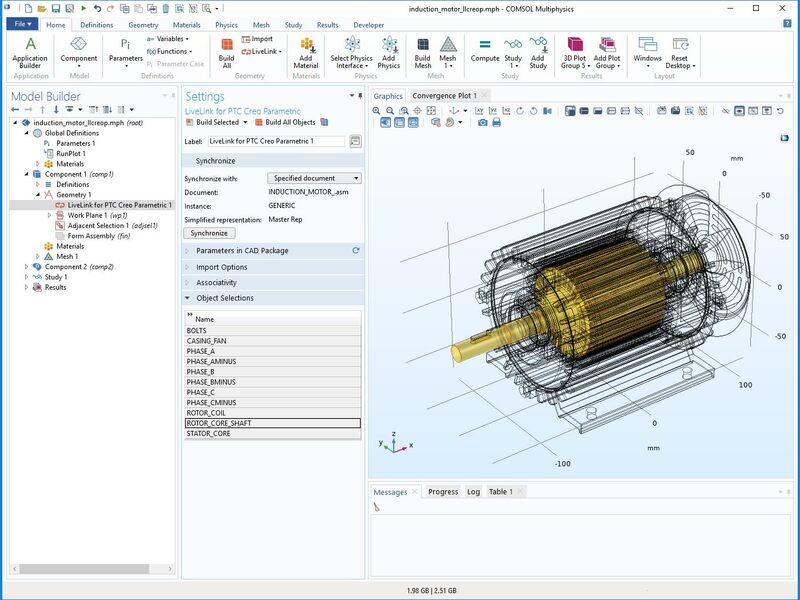 The 3D geometry and selections, which are used for the physics settings, are transferred from PTC® Creo® Parametric™ via the LiveLink™ interface. By defining a work plane in the 3D geometry, the 2D geometry used for the analysis is generated in the COMSOL Multiphysics® model using the Cross Section operation, which retains the selections defined in 3D. The Graphics window shows the 2D magnetic flux density norm results on the synchronized 3D geometry of the induction motor. The Plot 1 window displays the computed torque versus slip curves at different axial positions, as well as the averaged data.